Klingenstein-Simons fellowship will help Simon Sponberg reveal how neural systems organize for sophisticated behaviors like flight. “Movement is a defining feature of animals,” says Simon Sponberg. He is an assistant professor in the School of Physics and of Biological Sciences. How animals navigate their environments is the motivating question of his research program. Studying animal movement makes for riveting experiments. For example, Sponberg used high-speed infrared cameras to observe, at low light conditions, moths tracking 3-D-printed flowers oscillating at various speeds. The set-up emulates the natural world of Manduca sexta, or hawk moth. Like a hummingbird, this moth feeds by extending its proboscis into flowers, which may be swaying with the wind – at dusk. Such dynamic behavior requires neural systems to organize and coordinate many muscles to control the moth’s wings all in fractions of a second. It creates extreme motor and sensory demands on the moths. How do they do it? Using tethered moths tracking plastic flowers, Sponberg discovered that the moth slows down certain brain functions to improve its vision in dim light. 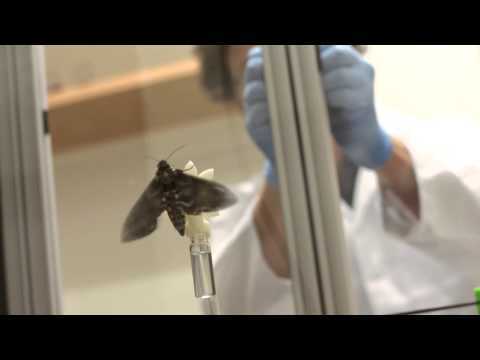 The moths’ neural circuits are adapting exquisitely to the environment. These findings are tiny pieces of a huge puzzle. The full picture will likely take a long time to complete. The work is part of Sponberg’s broader research goal: to understand how stable and maneuverable movement emerges from the neural and muscular systems of animals in their natural environments. If we know the biophysics of these movements, we may know how the brain could activate and control muscle to modify movement. “This award will catalyze a lot of work that would not be otherwise possible,” says Sponberg, who is also a member of the Parker H. Petit Institute of Bioengineering and Bioscience. “Specifically my research group has been developing a way to have unprecedentedly complete access to all the signals the animal’s brain is sending to its muscles, all during a challenging and highly dynamic behavior like flight. “Instead of getting a small piece of the picture of what the brain is trying to do, we want to have complete read-and-write access to its neuromuscular signals to understand how it is executing agile maneuvers. The research is informed by myriad disciplines: computational neuroscience, electrophysiology, neuromechanics, and comparative biology. Sponberg group’s research tools -- small force and torque sensors, miniature insect-sized backpacks, virtual-reality worlds that the moth can control like a video game, and many tiny electrodes tapping into the animal’s brain and muscles –will yield high-dimensional datasets of all kinds of physiological signals. From the vast amounts of data, Sponberg will extract neuromechanical principles. Ultimately, he hopes, the data will enable predictions about neural control and behavior.